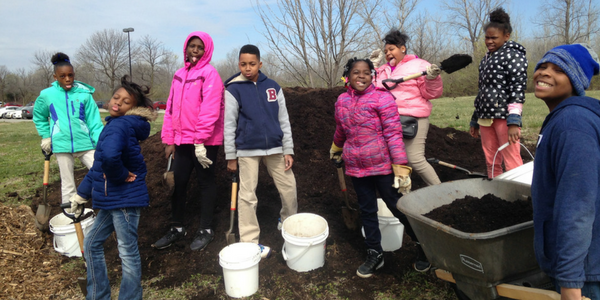 Saint Louis Public Schools have spring break next week, so students throughout the district have been tackling big projects in their gardens. Some of the garden projects were simply too big for students to complete during class time. Thanks to a bit of help from some amazing volunteers, the school gardens will be ready for warmer weather and planting after spring break. 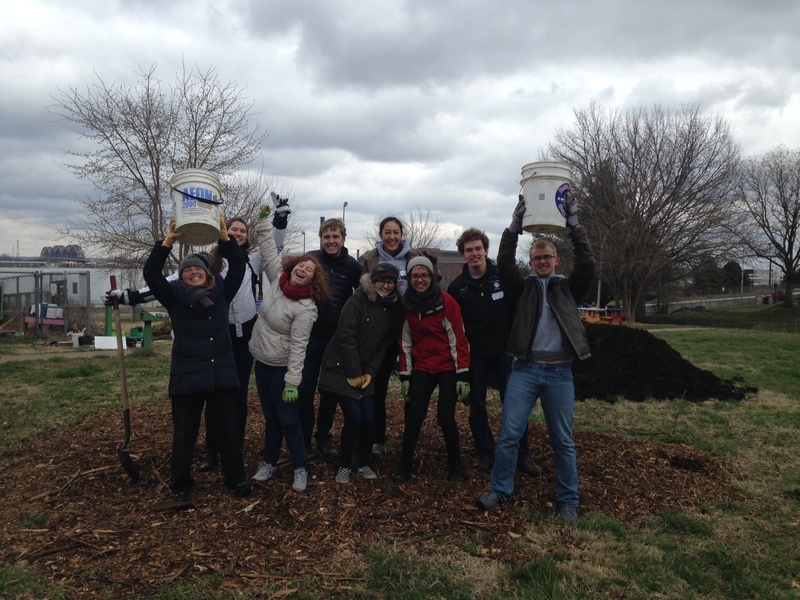 It may have been freezing, but the Washington University Danforth Scholars were a cheerful and energetic volunteer group! Last week the Washington University Danforth Scholars braved cold weather to spent a day of their own spring break working outside in freezing temperatures at Clay Elementary last week. When they signed up, they did not anticipate needing warm layers and hand warmers, but nonetheless they worked hard throughout the school day! The Danforth Scholars kept warm by moving mulch and compost, and tackled a tricky rebuild project of older raised garden beds. Throughout the day, these volunteers also visited classes and assisted with lessons on weather and ecosystems, pairing up with third graders as they made their weekly weather and plant observations. It may have been colder than expected, but the Clay Elementary students had a great deal of fun with the Danforth Scholars volunteers. Throughout the week, middle school students from the Wyman Center, a teen outreach and support program, also worked in various Gateway Greening school gardens to prepare for spring. On Thursday, Ferguson Middle Schoolers from the Wyman Center volunteered at Gateway Elementary. The Ferguson students worked with Gateway Elementary’s fourth grade students to finish installing new garden beds, moving endless buckets of soil and compost into new double-high beds and pulled out piles of weeds. Along the way, Gateway fourth graders fearlessly held giant earthworms and taught the middle school students about worms, and the Ferguson middle schoolers demonstrated excellent wheelbarrow skills. It was truly a community event with partners from MU Extension and Gateway Michael School coming out to work in the school garden with the students. For students to get the most out of their gardens, extra help is needed throughout the school year, but especially in spring. It takes considerable effort preparing the soil, moving mulch onto pathways, and expanding garden beds before the growing season begins. Endless buckets of fresh compost and plenty of humor at Gateway Elementary’s school garden last week. Volunteering in a school garden is an excellent way to learn more about programs in your local schools. Individuals and groups are welcome to volunteer in school gardens. You can help during big garden work days or implement a garden lesson. Please contact Gateway Greening Volunteer Manager Megan Moncure to learn more.